Please click here to register for any of the programs listed below. Skiing under the stars! Does this atmosphere sound good to you? If you answered yes, then you’ll want to join us for this unique program. Weather permitting, fellow skiers will gather the 1st Friday of the month for a special guided ski tour of our trail system. The warmth of a roaring fire, light fare and conversation will follow this nocturnal trek. This program is not for beginner skiers. (Weather permitting) Registration is required by noon, Thursday prior to the event. 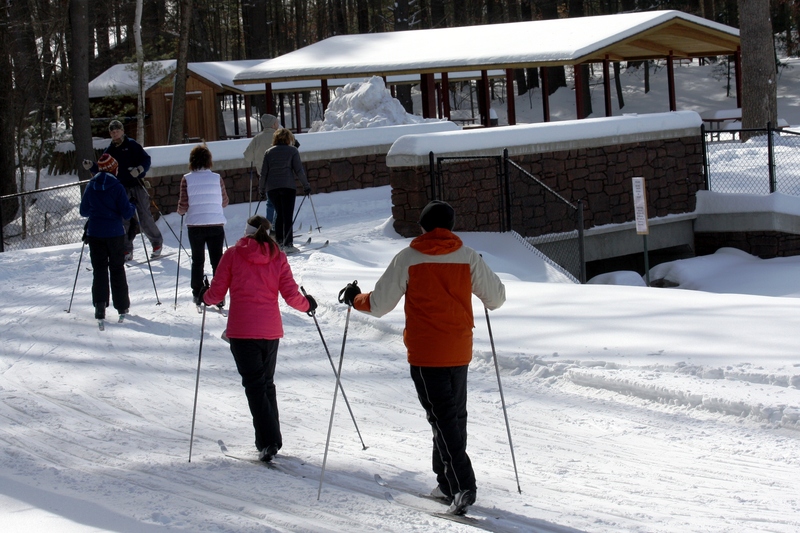 Novice to expert, young or old, all ski enthusiasts are encouraged to join us on Wednesday evenings, weather permitting, for an evening of skiing and snowshoeing. You have the option of racing others, racing for personal time, or simply getting out in the snow for your own fitness. The ski center will be open for your convenience. Rentals will also be available. We will also have Petzl headlamps and Suunto GPS watches to demo. Registration is required by noon on Tuesday. Fee: . . . . . . . . . . . . . . . . . . . . . . . $20.00 online in advance, Member discount fee: $15.00 Deadline for online registration is Thursday, February 8th. Have you ever wished that you could wax your own skis? Did you know that all skis need to be waxed, even waxless skis? In this program, our staff will walk you through the process of waxing your skis while enjoying some wine and a fire. We will talk about glide wax and kick wax as well and answer any questions that you may have about general upkeep of your skis. Registration is required by noon on Thursday prior to the event. Novice to expert, your or old, all ski enthusiasts are encouraged to join us. This will be a great culmination to our Tuesday evening fitness series. This is a 10k skate skiing event. This event is weather dependent. Day of registration is $30.